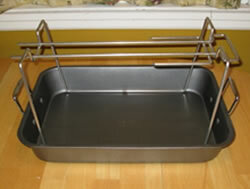 Place your new Ultimate Turkey Rack in your favorite roasting pan. 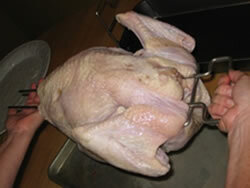 Slide the skewer through the bird from the neck end. It may help to pinch the rods together at the end. 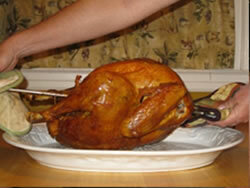 Drive the spikes into the shoulders of the bird until the skewer stops. 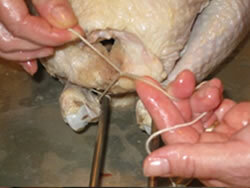 Tie the legs to the rods with cooking twine. 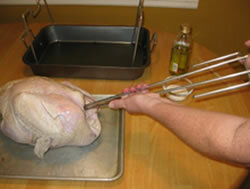 Place the skewer on the rack with the turkey BREAST FACING DOWN and the handled positioned over the side to keep it from sliding back and forth. 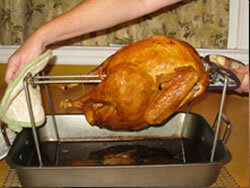 Roast the turkey breast down at 325F for three quarters of the total cooking time for the size of the bird. 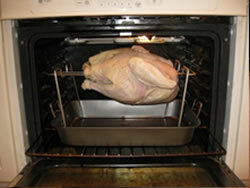 At three quarters of the total cooking time, PULL THE ROASTING PAN AND SHELF OUT OF THE OVEN and rotate the bird so the BREAST IS FACING UP and place back in the oven to brown. 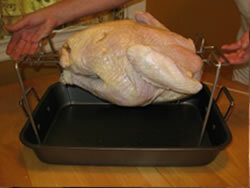 When fully cooked, remove the roasting pan and rack from the oven. 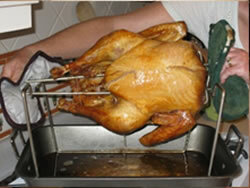 Holding the skewer from both ends, move the bird from the rack to the serving platter. 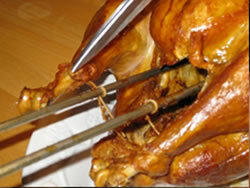 Cut the cooking twine to release the drumsticks. 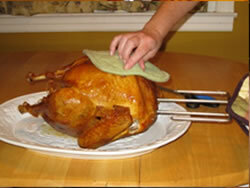 Grasp the skewer with an oven mitt and pull the skewer completely out of the bird. 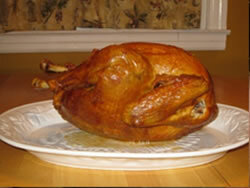 Your ultimate turkey is ready to serve with tender, juicy breast meat looking picture perfect.